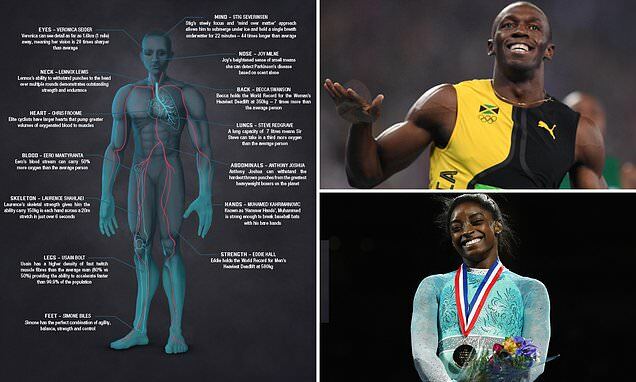 A physiologist and former British Olympian has unveiled the blueprint for what he describes as the world's 'ultimate superhuman'. Greg Whyte's design includes the acceleration of Usain Bolt's legs, the arm span of record-breaking swimmer Michael Phelps and the agile feet of gymnast Simone Biles. The ideal human - a composite of phenomenal humans from across sporting and other disciplines - also features cyclist Chris Froome's heart and boxer Anthony Joshua's ability to withstand punches to his gut. In a British poll athletics stars Usain Bolt and Mo Farah were named as the top real-life superhumans, with high marks for Roger Federer, Serena Williams and Jessica Ennis-Hill. The ultimate superhuman is likely to have legs like record-breaking Usain Bolt, Whyte said, with fast-twitch muscle fibres that provide the ability to accelerate faster than 99.9 per cent of the population. They will also combine the lungs of British rower Steve Redgrave - whose seven-litre capacity means he can take in a third more oxygen than the average person - with the neck of Lennox Lewis who can withstand punches to the head. Michael Phelps's arm span of more than six and a half feet - longer than his height - generates incredibly high forces and propelled him to his record 23 Olympic gold medals in swimming. The feet of gymnast Simone Biles, who won four gold medals at the age of 19 at the Rio 2016 Olympics, would provide 'the perfect combination of agility, balance, strength and control', according to Whyte.